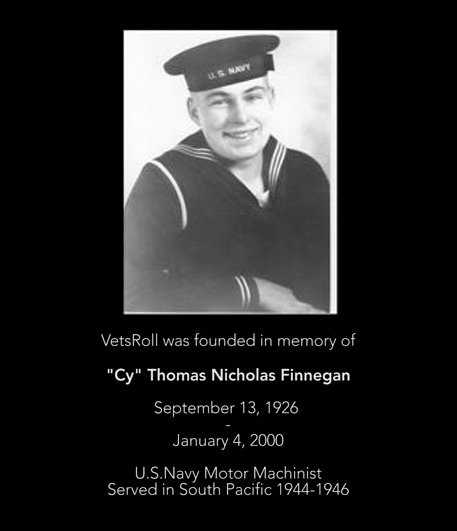 VetsRoll.org was conceived on February 1, 2010 by John (spouse-Kimberly) and Mark (spouse-Darlene) Finnegan, co-owners of Finnegans’ RV Center, inc. in South Beloit, IL. Finnegans’ RV Center was formed in 1969 by their parents, Cy and Barbara Finnegan. Cy was born in Litchfield, MN and was a WWII Navy Veteran (MM3) in the South Pacific Philippine Theater. Sadly, Cy lost a long and brutal battle to cancer in January of 2000; never having the opportunity to view the memorial that was built in honor of the WWII generation. Barbara is a lifetime resident of Beloit and worked as an Army Signal Corps civilian office employee as a de-coder for the War Department in Arlington, VA. She later worked as a wiring cable lacer at Jorgensen Engineering in Beloit until the end of the war. Barbara was treated as a ‘Rosie-the-Riveter’ (the mostly women who went into the work force during WWII to allow more men to head overseas; keeping our factories running at capacity and indirectly leading to the Allied victory because we wore down the enemy) with the VetsRoll group. Cy and Barbara met while Cy was attending a Fairbanks Morse Naval engine training school during the war and were married shortly after the war. Together, they raised 8 children (7 sons and 1 daughter) and actually endured the four eldest boys being in the service during the Vietnam War, although they all came home safely. They were married for 53-1/2 years, until Cy succumbed to cancer. Barbara still resides in the family home on Shopiere Rd in Beloit. After Cy’s passing, John and Mark carried on the ownership of the family business, but always longed for a memorable way to pay eternal tribute to their parents’ generation…’The Greatest Generation’. In September of 2009, the Finnegans’ were contacted by ABC-TV’s Extreme Makeover- Home Edition and supplied RVs for the cast to stay in during a build in Northwest IL. After learning of the need for the show’s subject family, the Finnegans’ decided to do a very quick fundraiser for the Stott family and raised more than $11,000 in just under five days! That experience, at the start of the current recession, showed the Finnegans’ that if the cause is right, people will still give from their hearts. A short time later, John and Mark learned of the wonderful Honor Flight Network that raises money to charter commercial aircraft on one day, round trip flights to fly WWII Veterans to Washington, DC at no cost to the Veterans. The Honor Flight program has ‘hubs’ located throughout America and has given America’s greatest heroes the opportunity to see their memorials before it’s too late. In 2010, the average age of a WWII Era Veteran was now in the mid to late 80s; time was NOT on their side. Sadly, it is estimated that this group of heroes is passing away at the alarming rate of 1000 each day! The Honor Flights have flown tens of thousands of these heroes to Washington, but the Finnegans’ believed the 18-20 hour days are quite long on someone of their age. Perhaps they could offer an alternative! John and Mark felt they had finally received their calling and began calculating the logistics and expenses of offering a similar program to the WWII Veterans. Since the Finnegans’ are in the RV motorhome rental business, John and Mark looked at doing a 4-day trip by combination of charter buses and motorhomes. They shared their ideas with several others in their circle of contacts and kicked off VetsRoll.org on March 17th, 2010, just 60 days before their planned departure of May 17-20, 2010. Veterans and volunteers began to sign-up and the donations started to come in and in just 60 days, VetsRoll.org had raised more than $90,000 to successfully schedule a caravan of nine motorhomes, three charter coaches and a support van, carrying 125 WWII Veterans and ‘Rosies’. Originally thought to be a ‘one-and-done’ venture, demand for subsequent trips continued and the all important donations kept coming and on May 16-19, 2011 VetsRoll 2 was carried out successfully with 200 Veterans (now including the Korean Era Veterans, along with the WWII and ‘Rosies’) and 100 assistants on board 10 charter coaches, with a media coach and a wheelchair lift-equipped support van. This second trip was also a monumental success and in late August of 2011, the Walworth County Fair in Elkhorn (Wisconsin's largest county fair) chose VetsRoll, Inc.® as their preferred charity and VetsRoll, Inc.® was able to raise more than $15,000 at that one event!! The Walworth County Fair has continued to choose VetsRoll, Inc.® as their charity since 2011 and this single fundraiser is annually the largest for VetsRoll, Inc.®! Each year, 200 more WWII and Korean Era Veterans and ‘Rosies-the-Riveters’ are treated to this trip; all at zero expense to the participants! Vets Roll 7 will once again bring Veterans, "Rosies" and Assistants to Washington D.C. on May 22-25, 2016 with continued support from volunteers and contributors.